Machine frames of the press brakes tend to deflect during the bending process which, if left uncorrected, will prevent the top tool from fully entering into the bottom tool. This means the bending angle will be inconsistent across the entire length, and a very inaccurate bending result will be obtained. However, WILA has devised a very advanced solution for resolving this commonly encountered problem: WILA Wave Wedges. 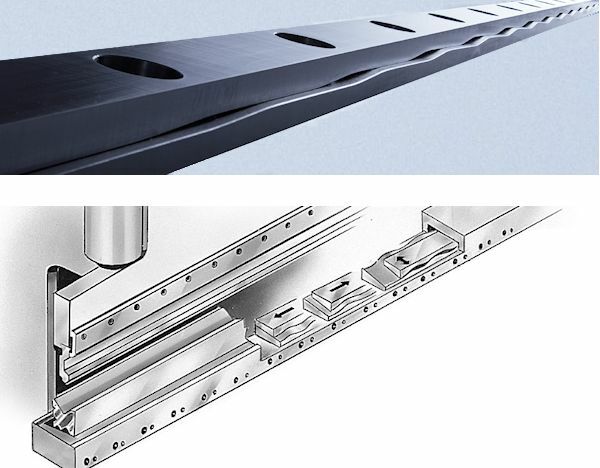 The WILA Wave Wedge is a special wedge system that you can incorporate into the lower beam or table of your existing press brake. This technology automatically supports bottom tools across the whole length of the press brake.